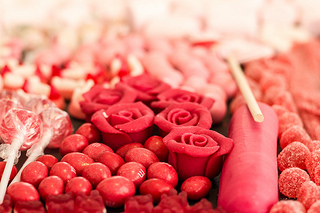 A red wedding centerpiece is a striking color for your table decorations and no other color says romance quite like red. It also looks rich but thankfully doesn't have to be expensive, here are ideas on how to create an impact at your tables without spending the money. Flowers are always the most obvious choice when it comes to decorations for your wedding and red roses are the most popular. Roses can be expensive especially at Valentines, a cheaper alternative could be red carnations which also have a very intense color. 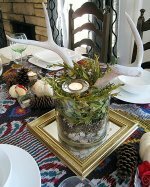 Bulk your centerpieces with foliage and then you won't be spending as much on the flowers. If you are looking to create the centerpiece yourself an easy one is to have a cube vase and pack the flowers into the vase with the heads of the flowers just poking up over the top. 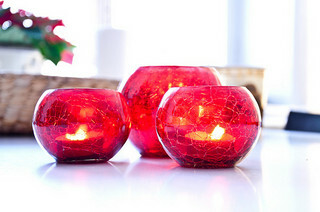 Add glass votive candles around the vase to make it look bigger and add sparkle for the evening. You could also place the vase and the candles on a mirror and then you have the reflection to give you extra color. The vases you use are important for the overall look of your centerpiece. If you use a clear glass vase you could add an extra touch of color with a red ribbon tied around the vase, or you could find red vases, jugs, or bottles for even more color. 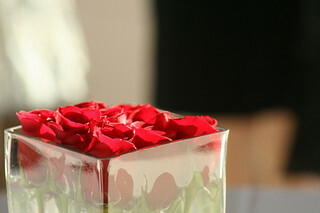 As well as roses you could look at just using the petals for your centerpieces. You can buy bags of Rose petals and it is seriously worth doing this rather than doing it yourself. I know that pulling petals off the flowers sounds easy but they can get bruised and wilt if you do this in advance, which you would be doing as you need to get married! 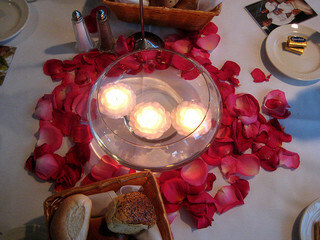 To save time and panic buy the silk petals if you were looking to have them submerged in water with floating candles and freeze dried petals to scatter on the tables. Freeze dried should not be put into water as they will soak up the water! Do not buy the petals from your local craft store as the little packets are expensive if you need a big quantity for all of the tables. Instead look at buying them from a wholesaler. Your red wedding centerpiece could be as simple as using red candles. Quite often venues will have candle holders that you can borrow and all you would need is to supply the candles. The venue may even do that for you too! 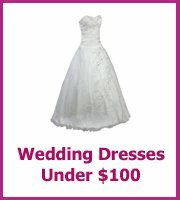 All you have to do is ask, if they don't have them then you will need to look at hiring or buying your own. When it comes to buying your own candle holders and candles cost out all of the options. A box of 72 glass votives may be a bargain but you would end up buying extras to add to the table for the decorations, plus one box might not do all of the tables. Alternatives to cost out are; 3 pillar candles on a platter with petals scattered on the table, 1 red pillar candle in a hurricane lamp, red glass lamp with a candle and red floating candles. A fun centerpiece idea is to have candy and there are lots of red candy options that you could use to fill a glass jar in the center of the table. You could have a mini scoop by the side of the jar and a paper cone or bag at each place setting maybe with the guests names on which can then be used as a name card and their favor. 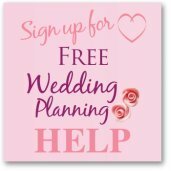 Love wedding items that have 2 jobs as you can use your budget for your favors and your centerpiece to create a really great table decoration. You could look at keeping your table decorations very simple and have red table linen instead, or to save money you could have red tulle. This could be tied round chairs or as a table runner. Red foil balloons can also be done yourself by buying the balloons and ribbon and then hiring the gas cannister. Red foil confetti on the tables instead of petals, you would need extra decorations such as candles for the tables to look good. 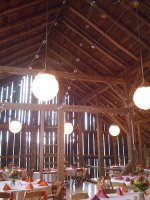 As well as the "normal" ideas for decorations it is worth thinking about everything that is that color and whether it would fit with your theme. 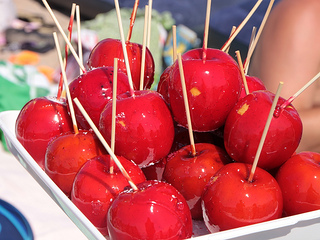 Take these toffee apples which are relatively inexpensive to make and can be made in advance, they would look great as a centerpiece either on a cake stand or a platter. Perfect for a fall or Halloween wedding.